This blog entry is a eulogy – and like all good eulogies, it starts with a poem. With one soft and fatal gasp. And to my neck I raise no asp. What words can I use to describe my long time kitchen companion? Reliable? Tireless? Efficient? All of those, and more. Yet, now that I think of it, undeniably more sluggish lately; struggling to do what had once been so easy … so effortless. Now those struggles are over, and my kitchen helper is still and lifeless. And, here, my confession: it was all my fault. I alone am to blame. Dessert was my idea, and it was the dessert that was fatal. The recently departed, dear, little three cup Cuisinart was a wedding gift, and over the years it made falafel with us, velvety soups, dips, salsas … too many things to list. It wasn’t the biggest Cuisinart in the world, or the fanciest, but it was always there. It was killed by two frozen bananas, which have become staples around here. An early commenter on 222 million tons shared this tip, “Sometimes I wait too long for my bananas to get that perfect balance of yellow and brown, so I freeze peeled bananas and then use it later for milkshakes! No need to add ice-cream or sugar to make it slushy or sweet.” It was wisdom we incorporated into our lives, to the detriment of our trusty little appliance. Mami, if you read this blog still, know that you have blood on your hands too. Cuisinart blood. The silver lining on all this is that our marriage has outlived yet another wedding gift; another milestone has been crossed. We now know that our love is stronger than a three cup Cuisinart, romantic words that may well end up on the family tombstone – a lyrical epitaph indeed. And now to practicalities. We will need to dispose of the body; of the sad, tiny Cuisinart corpse. In Japan, that would have been easy. 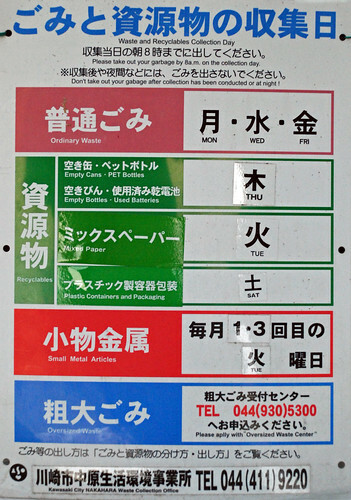 There was a shop that bought old appliances that could be salvaged for parts, and if they didn’t take it, the prominent poster over our garbage bin had information to steer us right. Here we’ll have to do a little research. And of course, although it’s a little soon to talk of such things, we will need a replacement – and if any of you have tips in that department, please share them in the comments. It may sound disrespectful, but we were ready for an upgrade anyway. As a final act of remembrance, I feel I should share the recipe that killed the Cusinart. Usually, people refer to this treat as “one ingredient ice cream”, but in our home it has another name this week. Slice finely with a heavy knife. Place slices in Cuisinart and let sit for a few minutes, to give them time to soften (especially important if your Cuisinart is on it’s last legs). Pulse on high until the bananas have the consistency of soft serve ice cream, or until smoke comes out of your Cuisinart. This simple dessert is rich, refreshing, loaded with potassium, made with no animal products, and potentially fatal. The last picture of my kitchen helper before it passed on. RIP, little friend. This entry was posted in Waste less recipes and tagged bananas, Cuisinart, food waste, frozen, frozen dessert, green, green living, one ingredient ice cream, recipe, recipes, sustainability, sustainable living, vegan, wasted food by Jean-François. Bookmark the permalink. Thank you. In lieu of flowers, please send contributions to the GE Appliance Donation Center. Oh no! We just bought our first food processor and I love it so much. It just makes everything so easy. I’m currently hoarding bananas in the freezer to make this ice-cream in the summer. They are great tools – looking forward to filling the void in the kitchen with a more powerful model (like your shiny new toy). 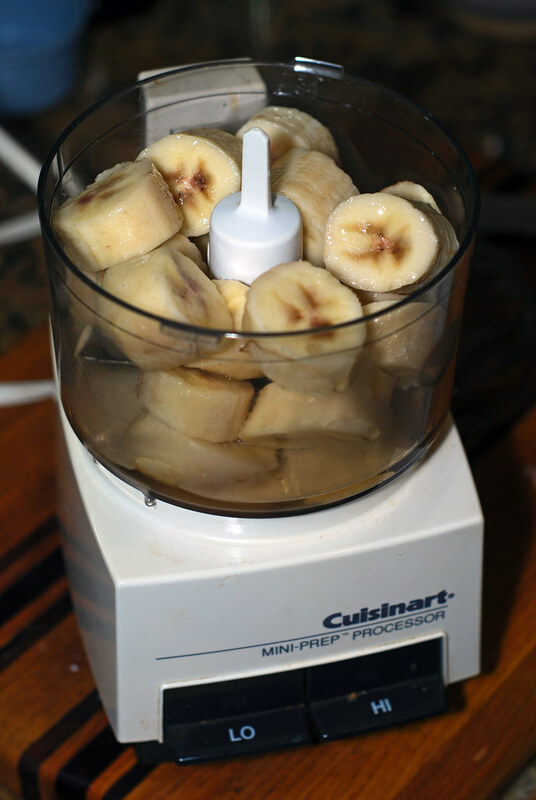 Re freezing bananas, as nice as the one ingredient ice cream is, what I really love them for is smoothies (esp. with home made soy milk). It’s the perfect quick breakfast when you’re on the run. The marriage outlives the wedding gifts. I like that! Obviously, the higher quality the gift, the bigger the challenge. Condolences for your loss. Congratulations on your long and happy marriage! Thanks on both counts … in the end, suffering this loss will bring us even closer. I’m laughing. I’m crying. I’m so sorry that you lost your beloved Cuisinart – but for a good cause! My marriage (so far) has outlasted just about EVERYTHING, save, maybe, my great-grandmother’s counter-top electric pancake griddle (it’s REALLY old…like 1940’s old, but stillworks great), and I wonder how much life it has left. There’s that strange “electric smoke” smell that my mother’s electric hand-mixer (switch broken…only works on whip setting) also emits when frothing something with gusto. I still can’t believe that either one still works. I have a hard time throwing ANYTHING away that still works. I will think of your Cuisinart when I use these precious Old Lady’s. RIP, little guy. And many more happy years of marriage for you two! I was actually thinking of your family and it’s recent ice cream withdrawal as I started to make this … though my attention quickly became focused on the smoke (which I at first thought was steam rising off of the cold treat). May your aging appliances last long, and your marriage longer. In electronics lab (back when I was still in college), we referred to that as “magic smoke.” It was magic because once the smoke escaped, the project usually ceased from working. We are freezing bananas as we speak! It’s a great solution for ones that are slightly past their prime (rather than becoming rose fertilizer). We throw them into green-or-fruit smoothies instead of ice (along with silken tofu) to thicken them up. Actually, we throw the bananas in the freezer when they’re at their prime these days – keeps the fruit flies away. And, now that you mention it, there was a very magical, transcendental feeling about that smoke. Like those ghosts that emerge from cartoon characters after they’ve been squashed. Maybe, like some VW Beetles (most notably Herbie), some Cuisinarts have souls. My sincerest condolences! Not just for the loss you have come through, but for the many, many more you will now suffer as you attempt to replace this loyal family member with one of the new appliances. Sadly, I too have lost old friends such as yours, and their longevity is to be mourned. The new models have marched in and out our door in anywhere from a week to 11 months, as all are designed and made to be seen and never used from what I can tell. Frail beauty without substance. Perhaps they are a sorry but fitting analogy for today’s marriage statistics. “Frail beauty without substance,” has to be one of the most lyrical comments I’ve ever gotten on this blog – and I can only hope that the wee Cusinart’s replacement is inspired by its predecessor to hang around for more than a week. Will definitely do a bit of research before investing. Keep your receipt, whatever else you may do. Good advice – I have a nasty habit of misplacing these things. I feel a little less guilty knowing that I am in good company – though I do feel a little guilty about my feelings after having done some research on the Cuisine Système 5200. I may be in love, and it feels just a tad wrong so soon after the demise of my little friend. Thanks for the tip – will take a look at the Kitchen Aid offerings. If they can grind bone, they should be able to handle our needs. 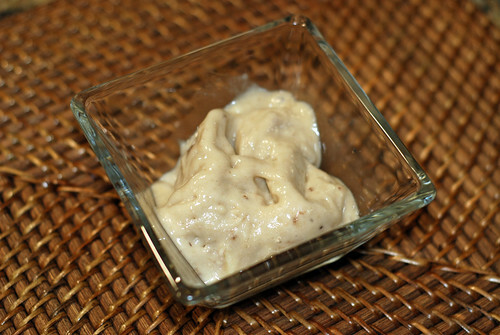 Mmm – home made cat food – no wonder they can wait for you to wake up naturally. But as it may seem wrong to admit, I am glad I read this entry to know that I have somewhat made it into your life as your coffee table, desk, and box-shelves have become precious members to our home:) We will most likely be moving again next spring, and they will come with us as well as the wedding gifts that we hope to someday outlive. By then, we will have a new addition to our family, too— expecting on New Year’s 2013!! Congratulations! As my baby shower gift (and out of gratitude for the many moments of frozen banana-derived joy in the past several months), I officially absolve you of any guilt in the death of the Cusinart. It hasn’t been replaced yet, and I’ll take a look at the T-Fals when I get back home (am toiling away in KL for a few weeks). Looking forward to seeing pictures of 赤ちゃん on FB in 2013. Eventually, I’m sure she, or he, will come to appreciate those box shelves as much as my cats did.